Set of 12 Christmas Cards with Red Envelopes. Artist Amie Kieffer continues her collection with Two Turtledoves. The inside includes an excerpt from the "Friendly Beasts" carol highlighting the dove and his mate cooing to Jesus. The back of the card lists the symbolism of the Carol of the 12 Days of Christmas. Box of 24 full color Christmas Cards with silver lined envelopes. Artist Elisa Armstrong created this whimsical Jesse Tree. Includes brief explanation of the tradition of the Jesse Tree. The back of the card is a "seek and find" of the ornaments and their Scriptural references. Inside: "Then a shoot will spring from the stem of Jesse, and a branch from his roots with bear fruit." Is 11:1 "Rejoice, Rejoice, to thee shall come Emmanuel!" Box of 24 full colored cards with accompanying gold lined envelopes. Twelve Days of Christmas Collection by MN artist Amie Kieffer. 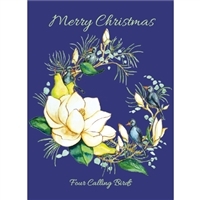 Four Calling Birds carol and rejoice over the birth of the newborn King. Nestled in a beautiful magnolia wreath, they sing songs so sweet and tender. Card size is 5x7 inches.